Krakow hosted an International Training-Qualifying Seminar OYAMA IKF. The event promoted 20 year anniversary of Oyama Karate in Poland (1991-2011). Two hundred participants from Poland, Germany, Belarus and Ukraine took part in the event. The meeting was subsidized by the President of Krakow, prof. Jacek Majchrowski. The main event was a full day seminar that focused on kumite. The seminar gathered chiefs of clubs, technical schooling directors, judges and holders of black, brown and green belts. During the official part of the meeting, Hanshi Jan Dyduch 8th dan , on behalf of Soshu Shigeru Oyama 10thdan and his own presented Shihan Andrzej Pierzchala with a certificate for a 6th dan. Our sincere congratulations, OSU! Advanced kicks in kumie. Shihan Andrzej Pierzchala 6th dan. Attack in kumite. 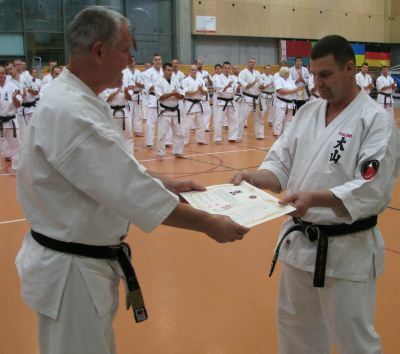 Sensei Rafal Majda 4th dan. Counter attack in kumite. Shihan Witold Choinski 5th dan . Advanced sports applications in knockdown karate. Hanshi Jan Dyduch 8th dan. All participants received an anniversary t-shirt with Japanese hieroglyphic, designed by a master of calligraphy Mister Masakazu Miyanaga.